Do you suffer a constant chronic back pain? If yes, have you gone for a medical diagnosis to understand the root cause of this constant pain? The earlier you go for a proper diagnosis the better it is, because it could be Ankylosing Spondylitis. Have you heard of Ankylosing Spondylitis? If you’ve read my previous post about Move with AS - Ankylosing Spondylitis (#MOVEwithAS) then you will have an idea what is this silent killer disease all about. 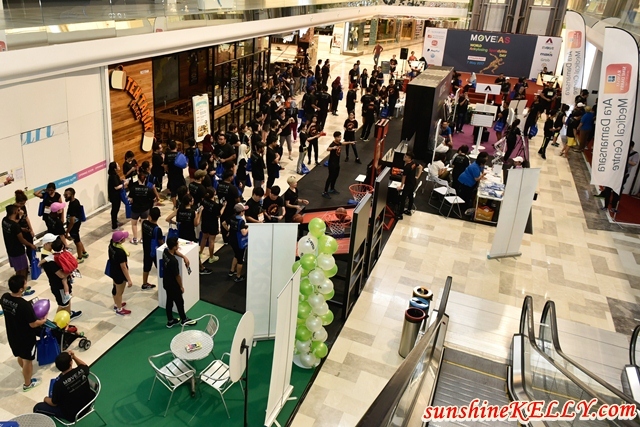 Last weekend we were at the MOVE with Ankylosing Spondylitis #MOVEwithAS Charity Fun Run at Evolve Mall, Ara Damansara. 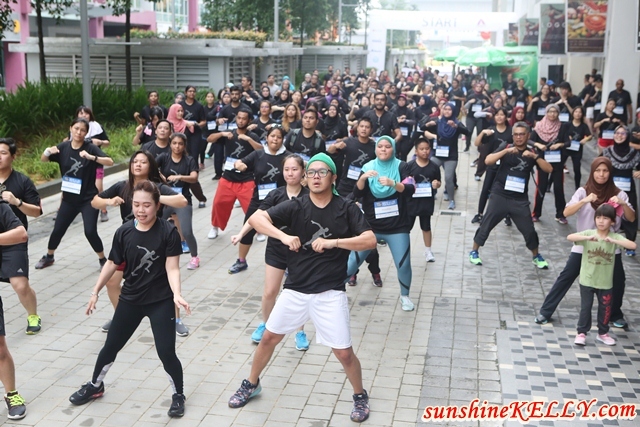 It was a short 3km run with 6 obstacles and 4 mini games plus there were many more activities prepared by the organizers aimed to educate and spread the awareness about this disease amongst the public. The morning kick started with good stretching with a energetic Zumba dance! Once we were all warmed up, the runners were ready to go for the run and obstacles challenges. There were 4 heats throughout different timings - 7am, 740am, 820am and 9am. I did the 2nd heat at 740am. Some participants came with their friends and family. Most of them were seen in a group. It was a short 3KM run starting from the mall passing by Ara Damansara LRT via Old Subang Airport Road then back to the mall. Upon our run back towards the mall, there were 6 obstacles awaiting our completion before the finishing line. Each of these obstacles was designed to educate us about the difficulties faced by Ankylosing Spondylitis patients on a daily basis. We always take things for granted - do you know that an AS patients can’t even bend their back or turn their neck? It’s a form of chronic arthritis that usually affects the spine, and joints especially larger joints. The symptoms however, may not be limited to the joints only. Patients with the condition might experience fever, fatigue, and loss of appetite. Eye inflammation (redness and pain) occur in some patients with AS. In rare cases, lung and heart problems might develop. We did it! 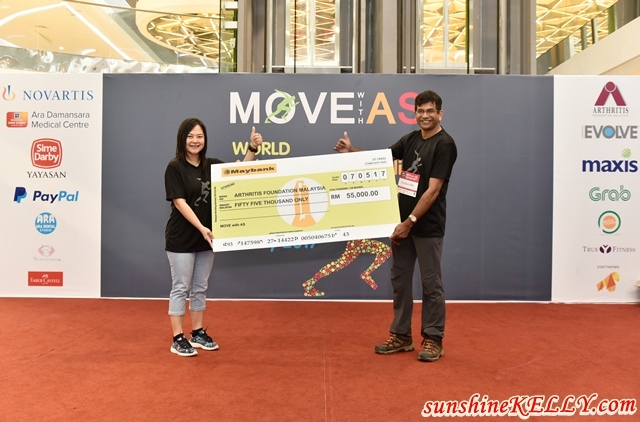 After the run and obstacles we went into the malls for the four fun games; redeemed our goodies and ice cream; did our body and dental check-up; at the same time there were talks and lucky draw prizes too. It is through runs like this - I hope that we will be able to raise more awareness about this disease so that people like you and I, would be able to go for early diagnosis and seek early treatment. Usually patients with this degenerative disease live life unaware and when they are diagnosed with AS, the disease would have developed to the advanced stages. The rate of early detection and treatment would rise in Malaysia enabling AS patients a better standard of living. 100% of the registration fees go to Arthritis Foundation Malaysia (AFM) to subsidize needy AS patient treatments. All in all, I had a fun morning at #MOVEwithAS. It was only a short time for me experiencing the sufferings and pain of an AS patient, I truly couldn’t imagine going through the challenges on a daily basis. Hopefully there will be more activities and programs to raise awareness about Ankylosing Spondylitis. I will definitely be the first to support this cause. Great event. Never heard about this before. New knowledge for me. This activity was a good awareness campaign for a serious medical condition. There is no harm in gaining more medical knowledge even though we may not be directly affected. Really fun run. I want to join it next month. I have not heard of the conditions but it sure sounds painful to do the simplest of task. Looks like a great event and thanks for educating us! Oh bae u really joined alot of run LOL. WHY U SO HEALTHY. Really envy lo.